Should not we balance our relations with donor countries, multilateral organizations and international financial institutions other than India and China? One gets to hear a lot these days about Nepal’s need to conduct balanced relations with India and China. Some argue that Nepal should employ its diplomacy to act as a bridge between the Asian giants. Trilateral cooperation among the three is seen by others as one of the best win-win foreign policy options. In truth, these are the academic discourses that sound tantalising, but offer no clear outlines on what possibly could be the main policy elements for pursuit of such relations. Important points on how to balance the competing economic and strategic interests of both neighbours are often found missing in such academic discourses. It is also unclear whether we are supposed to limit the practice of balanced relations only within the immediate neighbours. Should not we balance our relations with important countries, multilateral organizations and international financial institutions other than India and China? As China is emerging, followed by India, as global economic and military power, resetting relations with both should be of fundamental preoccupation for Nepal. But balancing relations with other important development partner countries should also be a matter of high diplomatic priority. How to go about refashioning existing foreign policy and sharpening diplomatic skills to effectively handle relations in the highly complex international system is the real pressing foreign policy concern before the government. Our balanced relations discourse must be broad enough to include immediate neighbours, other countries and multinational organizations. There are several elements that go into making balanced relation. Because foreign policy mirrors a country’s domestic policy, internal political stability and minimum national consensus on core foreign policy issues are essential. Consistent, coherent and credible diplomatic behavior is the second important component. Lack of consistency and coherence in what we say or do with our bilateral and international friends tends to erode our international image and credibility. In other words, balanced and measured diplomatic behavior is crucial in earning international respect, trust and support for our economic and infrastructure connectivity development initiatives. It requires more of diplomatic pragmatism than over-political enthusiasm. Strong institutions free of unnecessary political oversights but enriched with enhanced practical diplomatic insights are other important operational elements. Balanced and bold diplomacy is more about not allowing others to interfere in our internal matters through smart practice of diplomacy. This is possible only through courageous and consistent diplomatic behavior as well as independent but informed thinking when it comes to defending vital national interests. It also means being able to interpret and seriously analyse the threats and their implications for the country and carefully prepare appropriate responses, regardless of consequences. This can be achieved only when countries develop diplomatic prowess and insights. 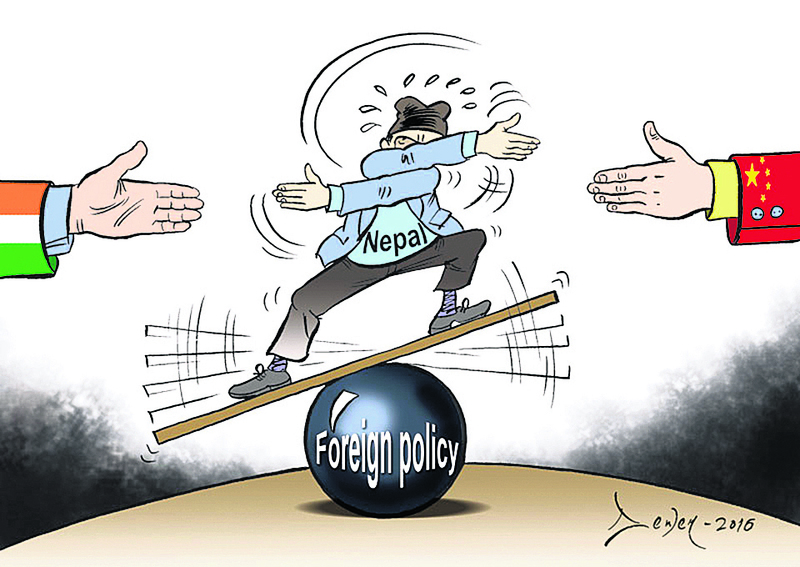 Nepal had successfully practised a balanced and bold foreign policy in the past. Acquiring membership of the United Nations and establishing diplomatic relation with China were two such bold and balanced initiatives of post-1950 democratic governments. During his brief but memorable premiership, BP Koirala conducted balanced ties with India and China on the basis of mutual respect without compromising supreme national interests. With India, he conveyed his national and international perceptions in a broad, balanced and bold manner. Independent foreign policy experts think Koirala’s domestic and foreign policy outlook was exclusively internationalist while King Mahendra’s was imbued with true nationalism. Mahendra may have his own personal flaws, as we all humans do, but many consider him and rightfully so as the real architect of modern Nepal’s domestic as well as foreign policy. He should be credited for practicing a balanced, bold and independent foreign policy. It was he who made Panchasheel, five principles of peaceful coexistence, the tenets of non-aligned movement and the Charter of the United Nations as the enduring underpinnings of Nepal’s foreign policy. He expanded Nepal’s diplomatic presence in the world by opening new embassies abroad and forging diplomatic relations with as many countries. Diplomatic relations with Pakistan, construction of Kodari-Kathmandu road and removal of Indian army check posts from the northern border, despite Indian reservation, and prompt recognition of Bangladesh as a new nation all give a measure of his balanced, bold and farsighted perspectives in managing foreign policy issues. It was during his time that Nepal was elected for the first time as non-permanent member of UN Security Council boosting Nepal’s international image. Foreign policy conduct was a top priority for King Birendra as well. Nepal enjoyed best of the relations with its immediate neighbours as well as with the international community during his rule. Post-1990, governments in Nepal have done little in foreign policy formulation and its implementation in line with changed national and international contexts. We continue practicing a foreign policy marked by contradictions and inconsistencies. There is a persistent lack of national consensus on vital foreign policy issues. There is little or no political commitment to reform our foreign policy initiatives. Many deserving and competent officials in Ministry of Foreign Affairs suffer stagnation for lack of government efforts to strengthen institutional and operational dynamism. Small wonder, therefore, that our diplomats have largely failed to interpret the shifting sands of international affairs, including challenges and opportunities. In the last several decades, we have had only a handful of capable and seasoned diplomats who the government could turn to for advice in times of need. Politics and diplomacy, it is said, are like two sides of a coin. A good political system with committed political leadership is an additional advantage for the conduct of successful foreign policy. Success or failure in foreign policy conduct has more to do with dynamic, decisive and visionary political leadership together with a team of capable diplomats. Nepal conducted successful foreign policy during the Panchayat era because of good political leadership. Our foreign policy then was farsighted, balanced, bold and driven by national interest. As a result, even in a highly bipolar world, Nepal could perfectly maintain nonaligned character and was twice elected in the UN Security Council, earning a respectable place in the comity of nations. Today, Federal Democratic Republic Nepal’s international image is steadily declining. Short-sighted political leadership which kept tinkering too much with foreign policy matters and continued overlooking the important role of diplomacy are largely to blame. There is confusion and contradiction in the foreign policy domain. We have lost much of our foreign policy moorings, our international image and respectability. New rays of hope have appeared in domestic political horizon. Protracted political instability and the bane of coalition culture seem to have ended at least for five years. There is a stable government in place with an overwhelming two-third majority. We have the prime minister who once led Foreign Ministry. It is fair to expect of him that he will soon start instituting far-reaching reforms in foreign policy domain. Delinking foreign policy and diplomacy from excessive political interference must be one of the priorities of his reform agenda. Dismal diplomatic performance of our diplomats is the result of naked political interference in envoy appointments. It must end. In the past few years, we have haphazardly expanded embassies abroad and created unnecessary posts in Foreign Ministry. This should be reviewed. This is important for country like Nepal because maintaining and managing embassies is a very costly proposition, even for rich countries. Too many embassies opened without purpose have proven to be mere drain on scarce national resource. It is, therefore, expected of Prime Minister K P Oli and his foreign minister to take into account these serious issues while undertaking reform measures. We desperately need to lift up Nepal’s sagging international profile through enhanced diplomatic performance. It is absolutely necessary to upgrade performance of diplomats. Appointing diplomatic greenhorns as ambassadors from outside must stop. The goal of ‘happy and prosperous Nepal’ won’t be met as long as conduct of foreign policy remains mired in inconsistencies and political interference. Prime Minister must be aware of this.